I will be away from my blog for a few weeks because of a trip to Greece. My husband and I and another couple are traveling to mostly the Peloponnesus area of Greece after first stopping in Athens. We have been to Greece several times before but our friends have not so we will enjoy being in one of our favorite countries with people who have not been there before. As I have done before on my travels, I will write about the gun laws in Greece. First let's talk about gun ownership in Greece. From the chart linked above we learn that the rate of private gun ownership in Greece is 22.5 per 100 citizens compared to the American 101.5 guns per 100 people! That, of course, means that in America, those who own guns, on average, own lots of them. The U.S. ranks number 1 in the world for privately owned guns. And yes, licensing of owners and registration of guns is required in Greece. There are .94/100 registered firearms in Greece. We don't have gun registration so we can't really compare that number. In our country there are likely to be almost as many illegal as legal guns owned by private citizens. That is a major difference between the U.S. and almost all other countries. The total number of guns owned, both legally and illegally is stunning. But what is more stunning is the rate of gun deaths in America compared to other countries. Let's look at gun deaths in Greece from the charts in the link, above. In 2009, the rate of firearm death was 0.59 per 100,000. In the U.S. that rate was 3.9 per 100,000 for 2009. I am not sure why our politicians have not figured out yet that high rates of gun ownership in combination with lax gun laws has led our country to be the "best" at killing people with guns while not at war. If they have and they are not doing nothing about it anyway, shame on them. In Greece, there are laws regarding possession of certain types of firearms so common in the U.S. Semi-automatic assault weapons require special authorization as do possession of handguns. A genuine reason must be provided to possess a firearm in Greece and there is a system of background checks as well. Gun licenses can be denied for family violence and ammunition is only permitted for the firearm registered with the government. But, oddly, carrying a firearm openly is allowed in Greece with some restrictions, according to this site. Since guns are registered and owners are licensed with extensive background checks, perhaps the carrying of guns is not as onerous as it is in the U.S. where we don't know whether someone openly carrying has had a background check for the gun or not. Greece, of course, like most nations, is not immune from the violence of war. Since ancient times, wars have ravaged the country. The Olympics were meant to provide a time of truce in the continuing battles for dominance in Ancient Greece. "During the Olympic Games, a truce, or ekecheiria was observed. Three runners, known as spondophoroi were sent from Elis to the participant cities at each set of games to announce the beginning of the truce. During this period, armies were forbidden from entering Olympia, wars were suspended, and legal disputes and the use of the death penalty were forbidden. The truce was primarily designed to allow athletes and visitors to travel safely to the games and was, for the most part, observed." Perhaps we should continue this practice. 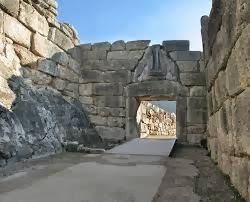 We will visit the ancient site of Mycenae from where Helen was supposedly kidnapped by the Trojans which started the war written about in the Iliad by Homer. 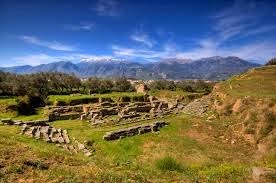 We will also visit Sparta which is the site of some of the worst of the internal battles in Greece between the city-states of Athens and Sparta. And since we are talking about wars and I mentioned that we are the "best" at killing people with guns while not at war, here is another stunning fact. The number of Americans who have died from gun violence since 1968 ( when Robert Kennedy was murdered) surpasses the number of Americans killed in all American wars since the War of Independence. That should give us all pause. War is terrible. Wars have been waged since people first walked the earth. Violent death by any means is always terrible and tragic. As human beings, we try our best to avoid violent deaths and war ( one would hope so anyway). So, also, gun deaths are terrible. We should try our best to prevent and reduce deaths cause by bullets but we aren't doing a very good job of it even though we have the means. But I digress. A few years ago, I wrote a blog post about the use of the phrase "Molon Labe" used by some gun rights extremists. I will be in the country where that phrase originated. It is worth our thinking again about what this Greek phrase means. Some folks in the U.S. ardently believe that the government is out for their guns. Of course, it is only the government of President Obama because they are convinced that any Democratic President is inherently a "gun grabber." So when any mention of reasonable measures to save lives comes up, these folks are ready for battle, like the ancient Greeks who cried "Come and get them", in defiance of the Persian army's demand for the Spartans to surrender their weapons. These modern day warriors are defiant and ready for a fictitious and manufactured "battle." It's much like the manufactured shut-down crisis in which we now find ourselves. It is a paranoid attempt to keep or gain control even in the face of defeat. I guess maybe we haven't learned a lot since the time of Leonidas. But at least he was fighting an actual battle. As we know, there has been political and economic unrest in Greece over the past few years sparking some protests in the country. Things appear to have settled down but it is safe to travel there and we will not be worried about gun violence while traveling in Greece. And hopefully there will be no general strikes to affect transportation or museums and ancient sites. I am happy to know that the Greeks have instituted common sense gun laws. The Greeks were among the first to think through what a democracy actually means. 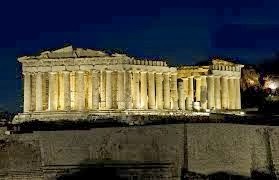 One can't think about Greece without thinking about Socrates, Plato, Aristotle and so many other great thinkers, scientists and politicians who walked the grounds of the now ancient ruins that we will visit. While we are away, as it now looks, our own country may be in economic turmoil. It is disquieting to think of traveling away from the U.S. anticipating that terrible things may happen while you are gone. I am hoping for a resolve to the stand-off and that common sense will prevail. As always, I know there will be more gun deaths and injuries in my own country while I am traveling. Though I intend to enjoy my trip to the fullest, I have some more posts in my queue that I will try to publish while I am away. Stay safe everyone and enjoy the fall colors if you live in a section of the U.S where the leaves change color. Speaking of Greece and "Molon labe", the gun guys didn't do their research. So I consulted with a leading historian of ancient Sparta. Turns out King Leonidas, who uttered those words, supported the sort of arms control that would make a modern-day gun nut scream for revolution.